1. Agents of Time. Although he’s been in the business for more than 10 years, ‘Agents of Time’ is Mathew’s debut album, released on his own label Wagon Repair. It includes a selection of pretty minimalistic yet melodic tunes such as ‘Marionette (The Beginning)’ who really deserve a listen on Trouw’s 10.000 watt speakers. 2. Fluid live show. Mixing several tracks after each other without pauses or disruptions is one thing. Producing music by coordinating hundreds of samples into each other and adjusting them live to the crowd’s mood is another thing. Few DJs can do this properly and in combination with a great light-show.. Well, go see for yourself. 3. The Lloyd Hotel. Most artists playing at Trouw sleep here, but it gives Mathew the creeps. Why? It used to be a Nazi ensemble and a prison back in the day. This guy could use some comforting from an enthusiastic crowd. 4. 10 years of prominence. Influential tracks such as ‘Decompression’, ‘Alpine Rocket’ w/ Luciano, ‘Marionette’, ‘Folding Space, ‘Typerope’, and ‘Return of the Zombie Bikers’ have found themselves on the top ten lists of artists such as Gilles Peterson, Richie Hawtin, Tiga, Sven Väth and Laurent Garnier. 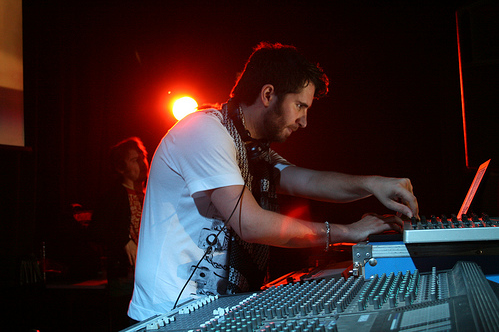 Mathew Jonson has been a key influencer of minimal techno music for the last decade. 5. Cobblestone Jazz. Ever heard of them? Mathew’s collaborative project with three other musicians. Give it a listen, it has musical knowledge written all over it. DJs Ryan Crosson aka Visionquest and local favorite Quince. Boom!